Previously, Zip served as the Executive Director for the St. Louis Metropolitan Council of the Society of St. Vincent de Paul. During his four-year tenure, the Society has seen rapid growth in programs designed to serve the poor, the needy, and the suffering. There are currently 24 programs that address the needs of a varied population of persons in need. The Society's 2600+ volunteers serve through visits to homes, hospitals, and prisons, through its thrift stores and food pantries, and through unlimited acts of charity including financial assistance. No act of charity is foreign to the Society of St. Vincent de Paul. Although Zip has a great heart for the Society of the St. Vincent de Paul, he tirelessly serves the community in many other ways. He consistently supports the efforts of other charities, including Covenant Network, St. Agnes Home, the Daughters of St. Paul, etc. He is widely sought after as a Guest Speaker and is known throughout the Metro St. Louis area for his moving witness to God’s place in his life. 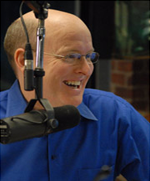 A nationally known author and speaker, Allen also hosts a weekend talk radio show on News/Talk WSB. The Allen Hunt Show's focus: It's not what's right or left but what's right or wrong®. Bringing a moral compass to the arena of mainstream talk radio. Talk radio is a natural fit for Allen. He loves to talk, and he loves people. Plus, he is full of opinions (and maybe a little wisdom too). Prior to talk radio, Allen was a Methodist pastor for nearly 20 years, including 8 years at one of the largest Methodist congregations in America (between 4,000 - 5,000 people attending each week). 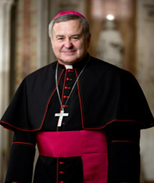 In January 2008, Allen converted to become a member of the Catholic Church. Much of his journey has been chronicled in his powerful book, Confessions of a Mega-Church Pastor: How I Discovered the Hidden Treasures of the Catholic Church. 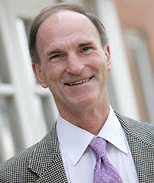 Allen now serves as Vice-President for Strategy at the Dynamic Catholic Institute. Allen grew up in the mountains in Brevard, North Carolina, and then graduated from high school in Lakeland, Florida. As a kid, he memorized baseball box scores and NCAA tournament pairings. Before entering full-time ministry, Allen worked in management consulting. One day, while entering a Wall Street high-rise in New York, Allen stepped over a homeless man lying on a subway grating for warmth. At that pivotal moment, God taught Allen that it was time to leave behind his own plans and embrace God's plans for his life. A life of serving others and following Jesus. Allen then became a pastor, and he has never looked back. Allen and his wife, Anita, met in college at Mercer University in Macon, Georgia. Along the way, Anita helped Allen earn a Ph.D. in New Testament from Yale University. Together, they enjoy a life devoted to loving God and helping people discover God's purposes. They have two daughters, SarahAnn and Griffin. 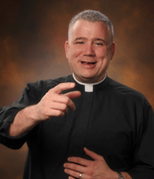 A gifted and captivating speaker, preacher, retreat master, and author, Fr. Larry Richards holds the answers to some of life's most profound questions. He speaks from experience as a pastor of an inner city parish, a high school chaplain, a counselor, and evangelist. Fr. Larry Richards has directed hundreds of retreats, parish missions, and conferences for young and old alike. His inspirational talks, presentations, and books--always authentic and enthusiastic--have changed the hearts, minds, and lives of millions of listeners and readers worldwide. Father Larry’s first book, Be a Man! Becoming the Man God Created You To Be was published by Ignatius Press in October of 2009, and was the #1 best seller by Ignatius Press in 2010. In Be a Man!, he recounts his struggles to learn true manhood as well as the inspiring stories of others he has served in his decades as a priest. He tells men how to focus on the right goal, how to live as a beloved son of God, of the need to acknowledge one's faults and to live according to the Holy Spirit, to be a man of true love and of wisdom, to appreciate properly the differences between men and women, to pursue holiness, and to make a difference in the world. Not preachy but direct, Father Larry challenges men to be strong without putting on a mask of false strength or machismo. He calls men to admit their weaknesses and limitations, while urging them to find strength in faith and genuine love to overcome their sins and faults. Fr. Larry Richards hosts a nightly radio show called “Changed Forever with Father Larry Richards.” It can be heard nationwide on Relevant Radio on Mondays at 5:00 a.m. ET/4:00 a.m. CT, Saturdays at 8:00 p.m. ET/7:00 p.m. CT, and Sundays at 11:00 a.m. ET/10:00 a.m. CT. He can also be heard on these local radio stations: WVKO, Redeemer Radio, WLOF, Real Presence Radio, Living Bread Radio, KVSS, KVBM, and WNGL. 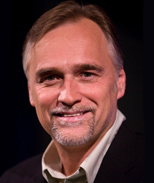 Peter Herbeck is the Vice President and Director of Missions for Renewal Ministries. Peter oversees the work of lay mission teams throughout the world who work to equip Catholic lay people to respond to the Holy Father's call for a new evangelization. He has traveled extensively in the U.S., Canada, Africa, and Eastern Europe for the past twenty five years, assisting and training local churches in proclaiming the gospel of Jesus Christ and ministering through the exercise of spiritual gifts. Peter is the co-host of the weekly television show, The Choices We Face, and the host of the daily radio show Fire on the Earth. Peter also is a co-host on Crossing the Goal, the popular new show for men broadcast weekly on EWTN. He is a frequent conference speaker and the author of books and audio tapes about discipleship and life in the Spirit. He has authored a book entitled When the Spirit Comes in Power and co-authored When the Spirit Speaks, Touched by God's Word, with his wife, Debbie. Peter holds a BA in Philosophy from St. Thomas University in St. Paul, Minnesota and an MA in Theology from Sacred Heart Seminary in Detroit, Michigan. Peter and his wife, Debbie, have four children, ages 15 to 23, and are members of Christ the King parish in Ann Arbor, Michigan.